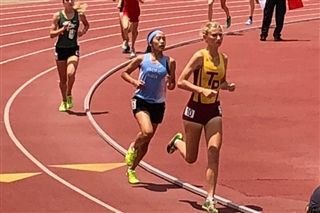 Sophomores Kimberly Cheung and Katarina Maric both had strong performances in the CIF Finals on May 26th. Kimberly kicked off the day with a personal record in the 1600 meters. Her 5:11.13 was good for a 6th-place medal in Division 2, and 8th overall finish out of 23 D1 and D2 competitors. Towards the end of the day Katarina ran the 300 hurdles and finished in 47.95, placing 5th in D2. Kimberly came back to run a PR in the 3200, finishing in 11:28.82. Congrats to Kimberly and Katarina as well as the entire 2018 Track & Field team! It's been a great experience for all the coaches: Reinke, Cantu and Edwards!